We turn your ideas into reality with our comprehensive product development capabilities - matching creativity with proven development experience. Big Ideas Production is a sports bag and accessories company based in China that designs, engineers, develops and manufactures innovative custom-made bags, travel gear, carrying cases & accessories for different sports and lifestyle industries at very competitive prices, impeccable quality, reliable lead time, and at the highest standard of service. Industries being served range from golf, tennis, motocross, bmx, rally racing, surf/skate/snow and technology as well as the mobility industry that produces memory cards, laptops, Mp3, cameras, camcorders and the like. 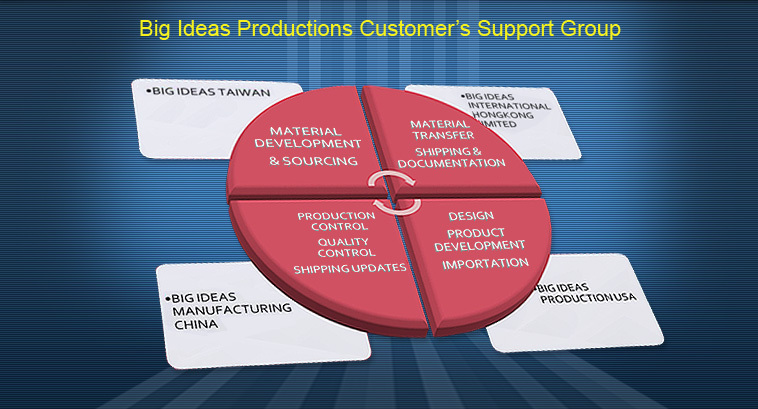 With its design studio located in Irvine, California, Big Ideas Production works closely on a one-on-one basis with each customer from concept, sketch, final CAD design, product engineering, costing, and shipping. With its manufacturing based in Dongguan and Shanghai, China, and materials sourcing in Taiwan, it controls and supervises all stages of product development from sampling, tool making, bulk manufacturing and quality control. It’s like having your own product development and manufacturing department without the expense of owning one.